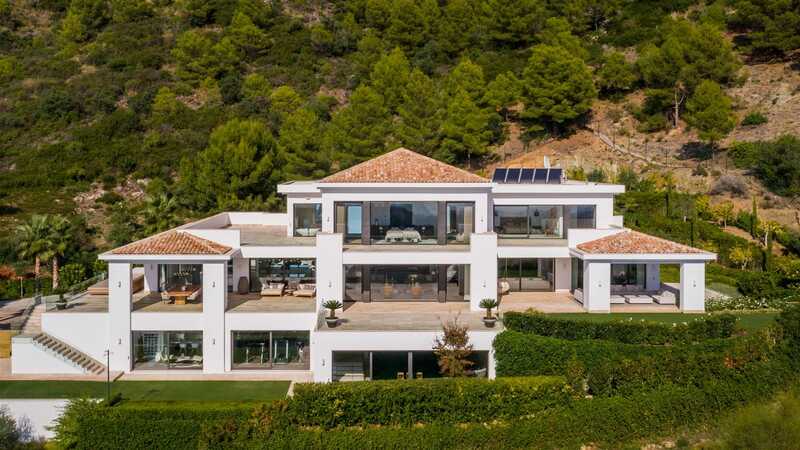 The very epitome of contemporary Mediterranean refinement, Villa Camojan is a luxurious eight-bedroom villa set upon 5000m2 of land within La Cascada de Camoján, one of the most exclusive gated residential enclaves on Marbella’s famous Golden Mile. This select and highly private residential area made up of luxurious villas on spacious private plots, backs on to the protected nature at the base of the dramatic La Concha mountain, from where it enjoys magnificent views across Marbella, the Mediterranean Sea and the coastline all the way to Gibraltar and North Africa. All the amenities of Marbella are on your doorstep, including shopping, fine dining, golf, sport, yoga, schools, clinics and many other services, yet this is a tranquil community within Sierra Blanca that ranks as its best address and one of the finest parts of the Golden Mile. Cascada de Camoján is a gated community with 24-hour security that offers peace and privacy with restricted non-resident traffic on its leafy streets. All around are space, panoramic views and the proximity of open, protected nature in an area that offers pathways for hiking, cycling or simply walking the dog. It is within this privileged setting that Villa Camojan offers ultimate comfort and style, comprising a total of 2,600m2 that includes eight bedroom suites, large lounges and reception rooms, a formal dining room, a beautiful kitchen with the top appliances and catering capacity, indoor and outdoor swimming pools, a private spa, gym and home cinema, as well as over 300m2 of garage space in which to display your cars. The panoramic open and covered terraces alone have a combined area of 830m2 in this modern Mediterranean villa designed by Ark Architects, offering a wide range of diverse vantage points from which to take in the imposing views on a gorgeous sunny Marbella day or starry night. The terrace features lounging and dining areas, a chill-out bar and jacuzzi near an impressive swimming pool set within beautifully landscaped gardens. Designed for those with demanding tastes, Villa Camojan is a prime luxury Marbella villa, but if your budget doesn’t stretch to this or you are interested in a different area of the Costa del Sol, please get in touch with us for a broad choice of quality homes for sale in Marbella and surroundings.